Oh that sounds like a great idea, a year is such a crazy time frame.. it seems so long but it also flies by so fast. Will you share highlights as you read? Love the comparison to these challenges by the way. Yes I'd love to. Giving highlights is a great way for me to review what I've read. I did some vision work today in my Bujo. I did this last year too. I think I have trouble connecting my goals to a vision I wrote out . I did write in my journal my big goals and my 3 years and I made some 12 week ones. Last year my visions didn't really motivate me that much. Or maybe they did? Maybe I feel like they didn't because I didn't achieve all my goals, but I did work toward some of them. And I didn't really think about my visions that much. It's hard visions can be not as concrete, but then I make them concrete, and discover that is not where I want to go. An example is fitness. A long time ago I made a goal to be able to accomplish the Kettlebell SImple. I worked on it forever, and then dropped it. I may go back to it someday. But for now I'm happy doing other things. I'm still achieving my goal of getting stronger, just not by that method. Continue getting stronger and more mobile. Be fit enough to do things that I want to. Be a person who moves , sits on the floor, is agile and strong. Be a person who has other people over to her house. Is willing to help others. Continue with my prayer group. Enjoy board games and socializing. A long time ago I made a goal to be able to accomplish the Kettlebell SImple. I worked on it forever, and then dropped it. I may go back to it someday. But for now I'm happy doing other things. You always manage to stay focused even if you change the method sometimes, but you have achieved so many of your goals. That's is very inspirational and a great achievement. Interesting to go down memory lane and just get your mind to refocus on what you want to achieve. Ugh, I typed up a whole bunch of stuff and then it got eaten . Short story : I used my downtime this week to write up some visions. I am Ranger braining right now and reading 4 books at once. Two of those are Twelve Week Year and The Marie Kondo tidying book. I think I need to focus so I am going to finish up the 12 week year. I need to re-focus on eating healthier. I was in holiday mode, then vacation mode, then sick mode, next week needs to be eat healthy in a way that will help me feel good long term. I wrote up a wonderful summary of what I read in The 12 Week Year, but I'm not going to re-write it. So my thoughts this year was to just do a couple of goals. I don't really want/ need a fitness big goal. I'm very happy just doing what I do, and maybe eventually doing something cool (L-sit, ) but no real time table. I think my two big goals are going to be tidying my house, and getting scrapbooks done. I think I would also like to gamify if and give myself rewards as incentive, and maybe see if I can get some sort of 12 week accountability group going. Our house is pretty clean, but all our drawers are overflowing and our garage is a mess. In general I'm very tidy w.r.t. my cupboards (clothing, linen, kitchen, etc. ), but our back room is becoming a mess. Unfortunately it has always been a storage room with big plastic boxes for hiking gear, boxes with the kids' school work for 4 years (need to keep as records), one whole wall are bookshelves, two big car seats from the rally car B is busy building, which he doesn't want to store anywhere else due to possible dirt, grease, insects, etc. If I can get that room tidied up more, I would really be satisfied. Oh and of course the huge climbing tree we built for the cat. Seeing as he is now allowed to play outside to his heart's contend, I can probably get rid of the climbing tree. That would already give us a lot more floor space. I think I would also like to gamify if and give myself rewards as incentive, and maybe see if I can get some sort of 12 week accountability group going. Also I hear what you're saying about the Kondo method vs Flylady.. however.... who has 6 months to dedicate? How do you envision that for your house? I'm down for longer challenges too. Now think about what your kids school work is going to look like in 5 more years, and you will see why I needed to declutter some. The Kondo method is much more about purging things than simply decluttering them. I read the book, agreed with almost everything in it, and then completely failed to implement anything. I'll lend you Stampy, our cat. He is good at shredding. Whatever is left of the papers, etc. can easily fit in a small black bag to throw away. I had to bin half of their gr.R (Kindergarten) stuff, because he somehow got into a box, shredded some papers and decided to sleep there. I can just imagine what you have to go through. Think you'll put together a scrap book for him show casing some of his cutest/most interesting/ projects through the years? Photos and actual papers will both work. I think doing it in full days (since I can) would work better for me then an hour here and there. That normally works better for me as well, because I have only one thing to focus strongly on. Sounds good, EG. I don't quite understand the difference between decluttering or purging? Is it just that purging = more? Can't say I have read the whole book yet, but from the series I got the impression that she leaves it up to the person to decide how much to keep, as long as it's all sparkly with joy. So not necessarily minimalistic? Thinking through why I get the impression she is more minimalistic; I think that is her preference. So, in the book, she talks about how few things people need. But, you are right, she also talks a lot about letting each person decide. That is why I bought the book after watching the show. I liked how in the show, she gave people room to keep the things that they enjoy, and she also understands that we often do have emotional connections to things. So, I think I change my mind. She is not minimalistic. She likes in her house to have very little, because she really, really, likes it organized. But, at least to me, the thing I associate with minimalism, is that we aren't supposed to have any emotional connection to our stuff, which is not what she is saying. As a matter of fact, I think her way of deciding what to keep and what to give away is what attracted me to the method. Keep the things that bring you joy. When you have only those things, then you will truly be able to enjoy them. Sorry, long answer. Introvert processing . Yesterday was good. Did my workout. Read some more of the 12 Week Year.Walked. Also started tracking in MFP, just for maintenance. Tracking in MFP helps me be accountable to myself. Seeing the numbers gives me a barrier to just eating for something to do. Today I plan on writing out some weekly plans and a couple other written assignments the 12 Week Year has. That stinks the forums ate your post, but I love your thoughts on the 12 week year and konmari! I'd totally be in for 12 week accountability as well, I need something to push me to longer term goals, not just in fitness, but in life too. 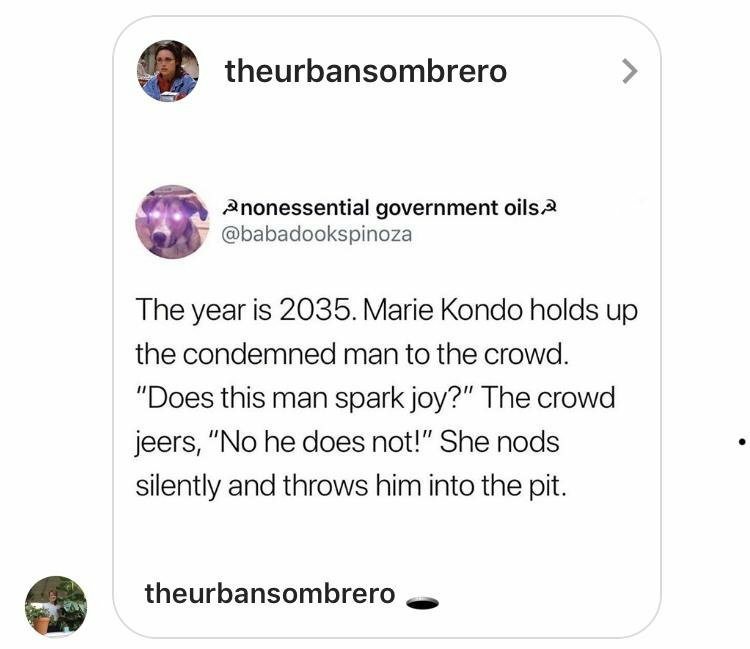 Last night's reading of the Marie Kondo book was interesting. She explained why she doesn't give a specific number of things to clean up. Some books say " You need 5 dresses, 4 pants , etc" She says that it is up to each person. If you decide, and you keep what brings you joy, then your home will be set up with just the right amount of stuff that you want. And that will keep you from getting cluttered again, because you are satisfied with the way it is. I wrote about how she was minimalistic, and then changed my mind on that. I think she writes her examples of what works for her, which is having very little, but she doesn't try and say everyone has to be just like her. @elizevdmerwe I read about books and thought of your question. She says she only has 30 books, she only keeps a few favorites. But, she also talks about clients who have more and are happy with that. I can't help but think of this post each time you guys use her name. It reminds me of that episode with the baseball cards.. the amount he had still freaked me out, but they were happier with it and that at least seemed to make it work. And those things also evolve right? I used to think you couldn't have too many books, but I've definitely changed my mind on that one. There's just plenty of crap out there. Ofcourse I still need an extra house to keep all the books I do want. Good luck with the goal setting. For me it's a scary thing sometimes.. because it defines the terms of failure in a way? Very scary. But also exciting! This is me And I don't think I need to change it much really. I like having my nightstand filled with interesting possibilities to read. Right, he still had several boxes, but they were all piled ,and it was amount that worked for him There was a guy with shoes that he collected since he was a teen too. He got rid of a lot, but still kept a lot. I agree on the goal setting being a bit scary. I've already had a talk with my perfectionistic self about it. I was worried what would happen if I said I would do the whole house Konmari style, and then got burned out and stopped half way through. I decided that the answer to that question is that I would be 50% cleaner than I had been before, and since I was going to hit the problem areas first, I would have accomplished a bunch. This is my second time reading The !2 Week Year. I didn't really notice it last year, but he talks about the fact that even if you don't hit all your goals , the important thing is you make progress, and the learning that comes with that progress. So, I'm really going to focus on that when I write my 12 week goals. I'm going to set up a point system, and I am going to make it a win to have 80% of my goal achieved. I tend to look at it as anything less than 100% is failure, so I am trying to correct that mindset. Did I mention that I got a weighted vest for Christmas? Squueee! I 've worn it for a couple of leg workouts ( my quads tell me about their feelings on that the next day) but today was the first day I wore it on a walk. The weights are really easy to take out or put in. I kept it pretty light since it was my first time . It was fun. I read about books and thought of your question. 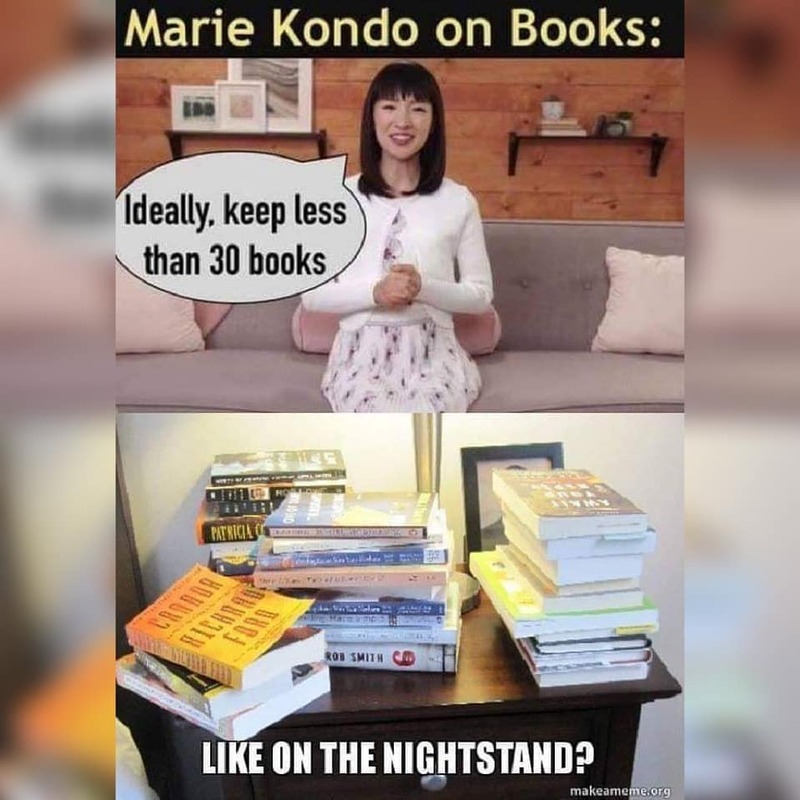 She says she only has 30 books, she only keeps a few favor﻿ites. I understand what you mean w.r.t. she wrote what worked for her as an example, but that people have to do what works for them. And that too might change over time. Today was good. I had my friends over for prayer. It's been a whole month since I've done that, so it was enjoyable. Then I walked with my friend. Came home and did my workout. I took a nap, then, still feel tired from my cold. Awesome to take a walk with a weighted vest! Way to Ranger that one! I went walking this past week, but seriously missed the loaded backpack, which was what we walked with last, last year. I really need to go on a hike sometime this year.